Well RENEGADE RACING ASSOCIATION's 4th race of the 2013 season is in the books, I'm beginning to wonder if we voted somewhere only to race under extreme conditions this season??? We've been thru 40 degrees 99% humidity / rain / and now temps in the 90's and I'm sure into the triple digits in the sun!!! Before I go any further I want to say A HUGE THANK YOU to Jim Curtis and the TRP crew!!!! Maybe it was the full moon, but something definitely reeked havoc all day long, I can tell you it was UNBEARBLY HOT just to stand on the starting line and these guys fought all day long through broken cars, oil downs, and unfortunately even a couple of wrecks...Great Job Guys and Thank You for all your efforts race in and race out!!! The guys competed for what will most likely be the biggest payouts of the 2013 Season for the Index Classes and that made for some intense competition. The Outlaw Class is still looking forward to the Rossler Outlaw Nationals - $2000 to win!!! Qualifying proved to be tough for the 9.90 class, after 2 chances to get it done 7 of the guys still went to fast. Your CHUCK's CUSTOM CARTS #1 Qualifier was someone many have been trying to convince to come get his feet wet with the RRA for quite some time, and in his 1st pass down the track with the RRA Tim Chillik puts up a 9.909 in his stick shift equipped 88 Mustang GT. Tim went way to fast in round #2 of eliminations giving the HEMLY TOOL Bounty up to Denny Moore. We will definitely be seeing a lot more of Tim in the future!! One side of the ladder Semi-Finals came down to Dennis Chillik in his 68 Torino taking on Dennis Moore in his 69 Camaro. Both racers ran a 9.92 but Moore was slow on the tree (which rarely ever happens) but it was enough to give up the round win to Chillik. On the other side it was Ray Tumbry in his 68 Nova taking on another new comer to the RRA Darrin Soterra in his 68 Camaro. Darrin took advantage of racers being allowed to double enter to run with the RRA in addition to TRP's program, and not only did he make it all the way to the semi's he also took home the SMITTY's CAR CRAFT Reaction Time Bonus in his 1st outing for his .020 light in rd # 1 of eliminations, but that's where his day came to an end when he was pushed out the back door by Ray Tumbry. Ray has fought through more mechanical gremlins than he would like to count, but finally got his day in the sun to make it through some hard fought rounds of racing. In the finals Dennis Chillik took him on the tree with an .03 light on a 9.96 pass over Ray's .08 light on a 9.91 pass to claim the victory. We saw a big shift in the points in this class, 3 of the Top 5 went out 1st round, another 2nd...Ray Tumbry made a huge jumped tied for 7th but 9 racers back from the top spot he is now in 3rd with 3 racers above him. Dennis Chillik moved up 3 spots to bring the #1 spot back to a tie, it is now Dennis vs Dennis / Ford vs Chevy topping the Championship race!!! Qualifying finally meant something big for the guys in the 10.50 class with 33 cars entered on a 32 car field!! This class struggled to slow it down as well with 8 guys breaking out during qualifying. TI DYNO's SWEET 16 bonus went to Mike Carroll, who qualified in the 16th position. Wow...talk about a fight to claim the HAGGERTY-MOBILE #1 Qualifier position!! Only .0003 separated the #1 Qualifier Gene Adamic and Mike Walker. Mike Carroll took Gene on the tree in rd #2 of eliminations to claim the PENN RACING Bounty. Mike Blair cut one hell of a light in rd #1 of eliminations to claim the MIKE BROWN CUSTOMS Reaction Time Bonus for his .0006 light. Semi-Finals paired Mike Carroll in his 68 Camaro with Terry Buza in his 70 Monte Carlo, and Mike Walker in his 72 Chevelle with rookie to the RRA Gary Wojwowski. As with so many rounds of racing in the RRA the semi-finals were won at the starting line. With Carroll and Terry both running a 10.53, Terry was .02 quicker on the tree to move on to the finals, and with that round win kept Mike from doubling with PENN RACING bonus. Gary's reaction time allowed him to claim the semi-final win with a 10.53 to Walker's 10.51. There are very few racers (if any at all??) that can say they made it to the finals their first outing with the RRA...definite props to Gary, hope to see him back out again stirring things up in this class. Terry Buza claimed the victory in the finals when Gary went deep which gave Terry the win. 2 of the top 4 went down 1st round opening things up for some shifting of points positions. All to familiar battle of the Mike's seems to be underway with Carroll and Walker now tied for the top spot, and Bob Singer moved up to 4th. M & M CHASSIS CRAFT #1 Qualifier, Dave took home the PERFORMANCE APPLIANCE Bounty as well. 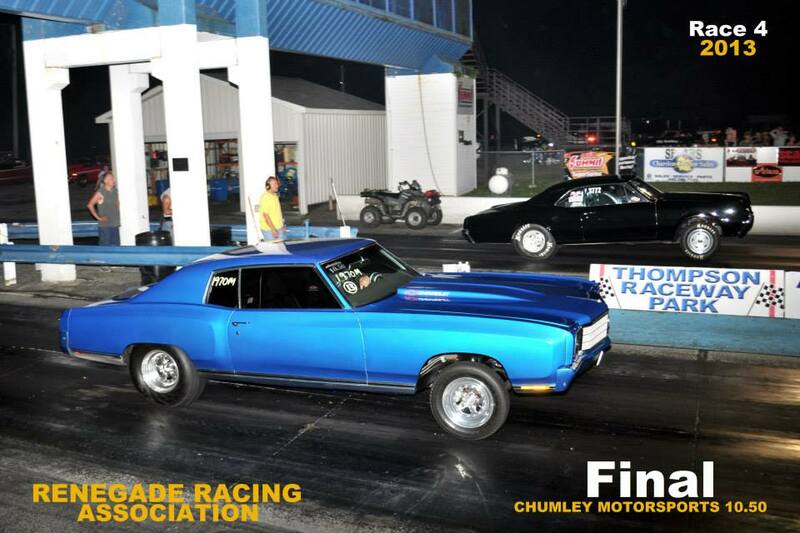 Ed McGuinn took Al DiSalvo's 1970 Chevelle on a heart stopping, jaw dropping ride during round #1 of eliminations pretty sure he may have driven that thing a 1/4 thru the 1/8 and still came out with the win!!!! Some serious skills behind the wheel there!!! Bill Travato came back out to join us this time with his new Camaro and WOW that thing is one gorgeous ride!!!! Sure hope to see him back out again this season!!! 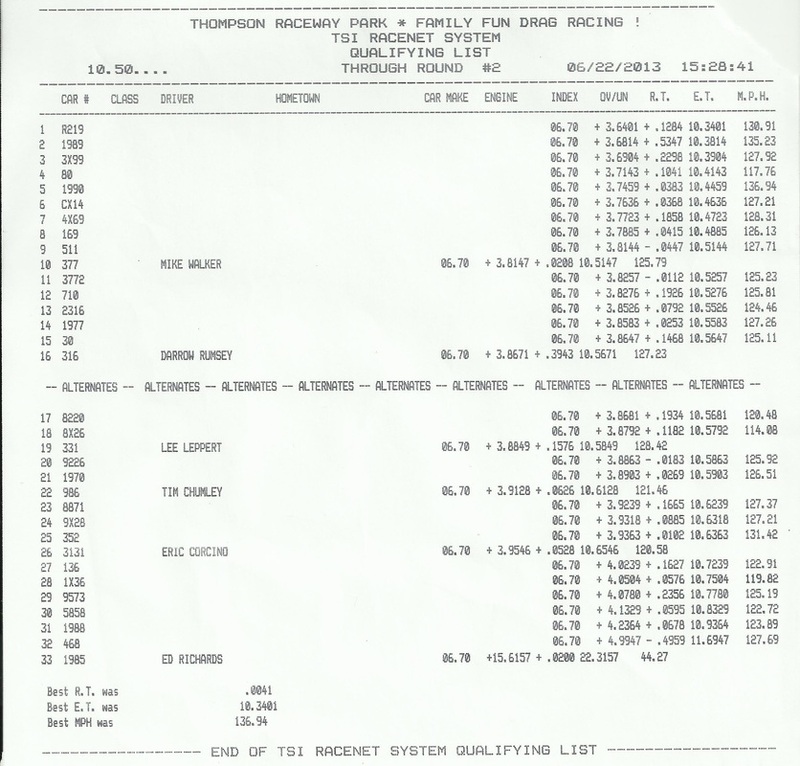 Mike Barran claimed the SKIPPY DID IT RACECARS Reaction Time Bonus for his .0005 light in the semi-finals. But unfortunately during that same pass Mike crashed at the top end of the track. Cars can be always replaced but people can't and we were all very grateful to see all the safety equipment did its job and Mike was ok and out of the car by the time we made it to him. Although he was obviously sore the next day, anyone who has met Mike knows what a great guy he is and how much he loves this sport, hopefully he is not sidelined to long. The series as whole has have been fortunate that this has been only the 2nd crash in 4 yrs, I think those are pretty good stats but obviously never want to see something like that go down. Dave Hinzman and George Rumore chose to split the purse as well as the QUARTER MILE FINISH Winners Bonus and will be facing off during the 1st round of qualifying July 3rd to determine who gets the 2 unclaimed winners points from June 22nd. As of right now, Dave Hinzman and George Rumore tied for the top spot in the STAINLESS WORKS Points Championship, making those 2 points definitely worth running for!! !